Question: Why is it important to participate in dissemination and to be incorporated in the desires of the public? You say that if a person misses an opportunity he is given, he actually steals his own chance to advance. Answer: One cannot be a serious student if he does not “continue” in the public. If he doesn’t, he has no spiritual vessel. I have to be connected to the upper, to the Creator, and also to the lower level in order to have someone who can receive from me and someone I can bestow upon. 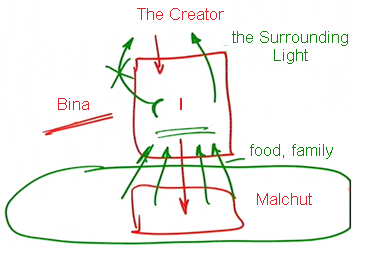 I am in the middle, the level of Bina, and below is my Malchut. It is impossible to work without this lower level. The more massive it is compared to me, the more attractive it is and the more it obliges me—like little chicks with open mouths or children who are crying and demanding from mom—the better. I need to feel the pressure from them; I need them to come to me and demand. First I come to them, but then they come to me and unbalance me. Then I have no choice but to raise their deficiencies to the Creator. They ask for food and peace in the family, and I ask the Creator for the Surrounding Light. I need them because otherwise with what can I turn to the Creator? I mustn’t ask for myself because I am the level of Bina and cannot worry about myself. If I don’t receive deficiencies from the outside, I will have no opportunity to turn to the Creator. Therefore, dissemination is important for a person’s well being. Otherwise, he will not raise MAN (a prayer) and will not receive anything from above. The level of Bina is absolutely neutral. It doesn’t want anything; it is absolute bestowal, Hafetz Hesed. Therefore we must go out to the public. Our world is absolutely managed from Above, and we could easily pull it behind us even with the spiritual power we have now. But this heaviness is intentional so that we will ask the upper Light for the people. This is the reason that so much pain was sent to them and this is the reason that all the nations blame Israel for their problems. We have to be incorporated in everyone’s desires and to ask the Creator for them and pass on His response to the people so that they will feel good. Then they will depend on us since we convey the upper Light to them, the filling, the force, the way. Unless we connect this whole chain in which we are the central part while the Creator is from Above and the created beings are from below, things will be bad for us and for the world. This is the reason that dissemination is so important and without it there is nothing we can do and no way we can advance. I turn to all my students all over the world: You must understand this simple drawing! Everyone must disseminate, as it says: “I have learned much from my teachers, more from my friends, and most of all from my students.” To learn means to receive a deficiency and to ask for a filling for it from Above. Everything is received only from Above. When I go out to the public I feel that I must fill them since I have promised them. These are not promises of politicians before the elections that are usually forgotten the next day. Here you cannot forget your promises because you absorb their deficiencies inside you and have to process them into the demand for the Light. You feel fear and awe because nothing can help them but the Surrounding Light. You cannot give them what they want by yourself. You have nothing, and this forces you to raise a prayer. It is impossible to connect to the Creator otherwise. This is called from the love of the created beings to the love of the Creator. The love of the created beings is aimed downward toward the people and the love of the Creator is aimed upward, and there cannot be one without the other. There is nothing you can turn to the Creator with other than the deficiency of others. Dissemination is a gift from Above. We are suddenly given such an opportunity. When we go out to the public and explain to people that we have to be united, we receive from them the need to turn to the Creator even though their desires are totally corporeal.